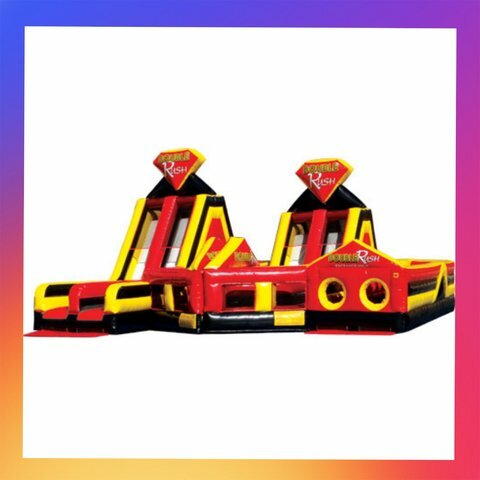 This massive dual obstacle course and double slides is our newest inflatable play structure and is sure to create squeals of excitement at any party or event. The oversized Double Adrenaline Rush has a bright, colorful theme of yellow, red and black... perfect for high-traffic events. The rush is set up for friendly competition play, with dual entrances and exits. This is a very impressive structure with two 30-foot obstacle courses and one 16-foot slide and one 18-foot slide The Rush is ideal for Family Entertainment, corporate events, camps or backyard parties.